When it gets hot outside it’s more important than ever that you turn to melon recipes that are refreshing and can help keep you cool. As you wipe the sweat from your face you probably won’t feel like eating a hot bowl of soup or a hearty steak (though if that’s what you desire, who are we judge). You will crave foods that are chilled and help hydrate you, which is where our tasty friend Mr. Melon comes in handy. Melon is versatile in that it comes in a wide variety of colors, textures, and flavors, and it can be used in an even wider range of dishes from smoothies to desserts to salads and beyond. 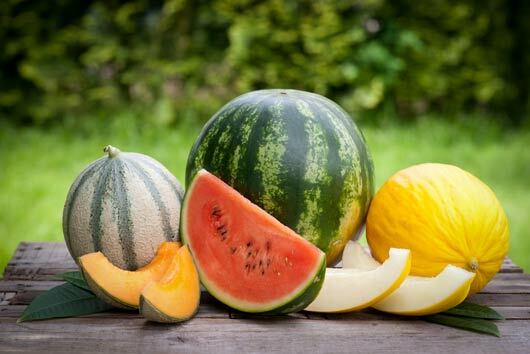 The most common types of melon include watermelon, cantaloupe, and honeydew, though there are more exotic melons as well if you really want to get creative. Each offers its own health benefits and nutrients; for example, as NatGeo reports, “a 10-ounce (300-mL) wedge of watermelon packs in about one-third of the recommended daily value of vitamins A and C, as well as a modest amount of potassium (9 percent of the daily value).” Cantaloupe is also packed with beta-carotene thanks to its orange color, as well as other nutrients like magnesium, fiber, and vitamin K. Something all melons have in common is their high water content. Watermelon has 93% water content while cantaloupe and honeydew both boast 90% water. So if you’re hot, thirsty, and hungry, recipes using melon as a key ingredient are a great way to hydrate and refuel this summer. Here are 10 melon recipes that you need to try this season.